All eyes are looking to the new sustainable development goals (SDGs) to set a new standard for international cooperation with lofty ambitions of leaving no-one behind, a universal agenda that applies to all countries, environmental sustainability, accountability and creating a data revolution. I fear, however, that the mundane reality of international development politics may win the day and we will have a framework that sits comfortably within existing priorities, where only the loudest voices are heard. A case in point: as we wait for the UN Secretary General’s ‘Synthesis Report’ on how these negotiations should proceed, the High Level Panel of Eminent Persons wrote an open letter to UN member states setting out its assessment of what needs to be done in the year ahead. This Panel has previously done much for setting the bar high for a transformative post-2015 agenda. On the surface, its agenda is slick, attractive and inspirational. It is a platform for action I want to support. Yet it has fallen at the first hurdle. 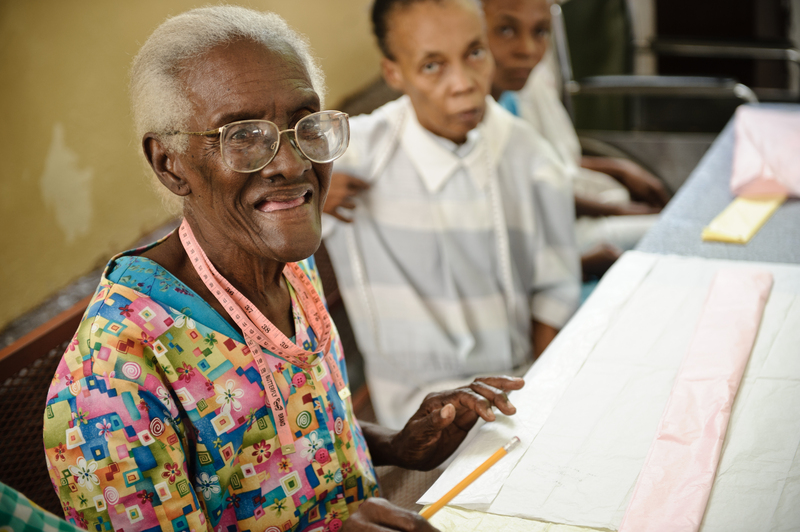 Marie attending a sewing workshop in Haiti. The ink was hardly dry on the proposed 17-goal framework agreed by the UN’s Open Working Group before the High Level Panel forgot about a key marginalised group: older people. This same group had also been written completely out of the development agenda by the MDGs. One-fifth of the world’s population will be over the age of 60 by the time the post-2015 framework comes to an end. Despite the rapid demographic changes taking place worldwide, the multi-generational realities evident in all countries are still being ignored. The MDGs are said to have catalysed a response to the challenges of poverty and achieved enormous success as a result. However, where ageing and older people are concerned, the MDGs also institutionalised marginalisation and discrimination. 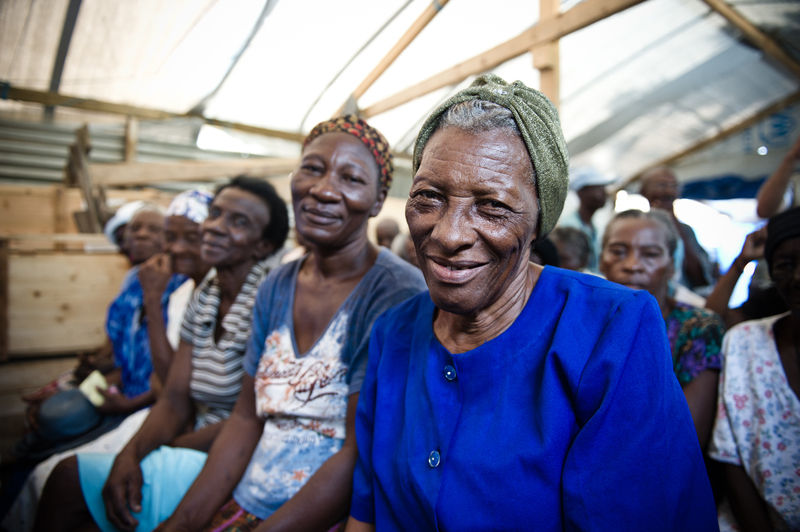 The irony is that longer lifespans and greater numbers of older people are one of the success stories of the MDGs. Yet here we are again looking at poverty and environmental sustainability through a simplistic lens that cannot help but fail to recognise where poverty, vulnerability and marginalisation lie. There is also no way of capturing the intergenerational support that has been the mainstay of families’ response to crises such as HIV & AIDS. Some would object to a long list of ‘marginalised groups’ as part of the new framework, but we are not talking about a separate group of people competing with others. Recognising ageing and older people is about understanding how we support an individual at all stages of their life. It is not enough to just offer education and employment opportunities when people are young, we also need to ensure their later life is not characterised by discrimination, isolation and marginalisation. Disaggregating data under the heading of ‘other’ is not enough to make sure this will not happen and takes us no further towards the aim of ‘leaving no-one behind’. When negotiations on the framework begin again, I want to be confident that we can look older people in the eye and tell them they matter, that they are included. I have great hopes for what the post-2015 SDG framework could achieve. But not if we continue to ignore the realities of development and the role that ageing and older people play.